MILES OR KILOMETERS ONE PASSION UNITES US ALL. 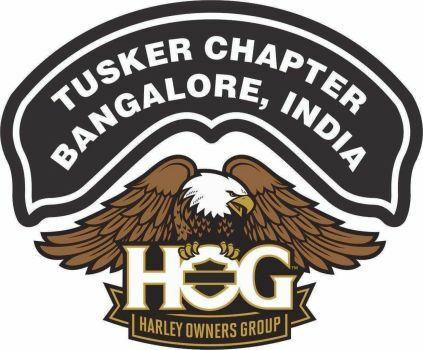 It is with great pleasure that we at Tusker Harley-Davidson®wholeheartedly welcome our new HOG members to Tusker Bangalore Chapter. “ The membership will help all riders along with their families maximize what the HOG Community can offer and not to mention the various benefits the members stand to gain. Our relentless effort in supporting our HOG is guaranteed, coupled with a pledge to keep your Harley-Davidson experience memorable. Tusker Bangalore Chapter is considered as the most active Chapter in the country. Tusker Harley-Davidson has been adjudged as “The Dealer of the Year” and Tusker Bangalore Chapter has been awarded as “The Chapter of the Year” for the years 2011 and 2012, 2015 respectively. There is a lot of riding going on and On every ride, we create memories that are special to us. 4. Put your rain gear on before the rain starts. wet. 5. Wear bright colors for increased visibility to others. 6. Transfer wallet, keys, and other essentials to waterproof TURNING outside pockets. 9. Increase your following distance, and watch for tailgaters. 10. Avoid standing water as it can hide potholes and debris. 11. Check tire pressures periodically. Underinflated tires are nervous wet weather riders. Turning in too suddenly, with too much more likely to hydroplane. turning force, too soon, can cause the front tyre to slide. 13. Gently apply brakes periodically to wipe rotors of water/ mud/debris. Throttle control is the most important skill to master. 14. Watch out for painted lines, arrows, etc. as they can be application of force will break traction and the throttle is no exception. particularly slippery. Better to avoid risking a nasty, out-of-control fishtail. 15. After the ride, don't pack your rain gear away until surface irregularities dry. 16. Avoid Painted lines, Surface Texture, Manhole covers/ can have the rear wheel slewing sideways and out of control railroad tracks, Puddles/Pot Holes, Oil Etc... surprisingly quickly, so be careful.